INTO THE NEXT STAGE: 4/29/1992, aka Sa-I-Gu: Has the Dream That Died Been Reborn? You are at:Home»English»INTO THE NEXT STAGE: 4/29/1992, aka Sa-I-Gu: Has the Dream That Died Been Reborn? 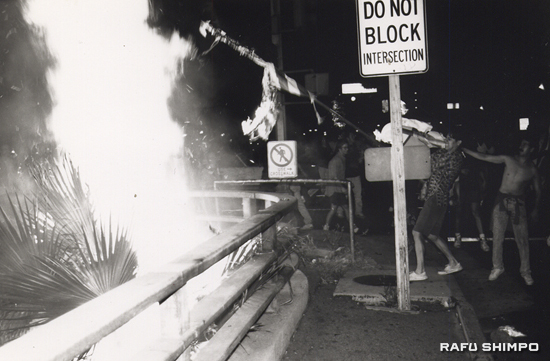 Rioters set fires in downtown Los Angeles on the night of April 29, 1992 following the Rodney King verdict. I wrote the preceding for Rafu Shimpo, published May 3, 1992 in this space, after what some called the Los Angeles Rebellion, others the L.A. Riots. For Korean Americans, it was to become known as Sa-I-Gu or 4-29, the day hell visited the City of Angels. What I personally remember from 20 years ago: leaving work early to get out of downtown Los Angeles, where I then worked, with a great sense of unease. As I was driving west on the 10, fires burned north and south of that freeway. Arriving home in Santa Monica, however, things seemed perfectly normal. Had I not seen and smelled a city on fire and not viewed the TV news coverage, it would have seemed like any other day. But it wasn’t. It was surreal. Two decades later, we can come to a conclusion similar to that of the 1982 Commission on Wartime Relocation and Internment of Civilians — hysteria, racism and a failure of political leadership — when it looked back at what happened to mainland Japanese Americans decades earlier, for what happened to Korean Americans with Sai-I-Gu was a condensed, real-time, present-day equivalent of what happened to Japanese Americans with Executive Order 9066: For Japanese Americans, the failure was at the federal level; for Korean Americans in L.A., it was local. Some images of that madness were captured by photographer Hyungwon Kang, then employed by The Los Angeles Times, now Reuters’ senior photo editor for the North America Pictures Desk in Toronto. I spoke with Kang about his recollections of the time. He is at present here in Los Angeles for a 20th anniversary piece for Reuters on the riots. He has lived elsewhere for many years now. Kang told me how 20 years later, the cityscape looks about the same to him, with the exception of some new shopping areas in and near Koreatown. In South Central Los Angeles, he said he couldn’t help but notice a greater Hispanic presence compared with 1992. “It seems there have been some demographic changes in South Central and a rejuvenation of economic activity around Koreatown,” he said. Just as the effects of E.O. 9066 proved to be a pivotal point for all Japanese Americans, regardless whether they were directly impacted — it was different in Hawaii, for instance, and for mainland Japanese Americans who already were living in the Midwest, the Mountain states, etc. — Sa-I-Gu, according to Kang, affected Korean Americans deeply. 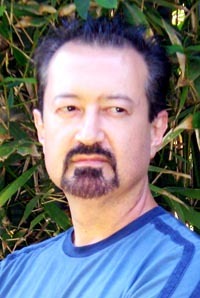 In 1992, Kang said he drove through the infamous intersection of Florence and Normandie (where Reginald Denny was to be brutally assaulted) in a company car within an hour of the verdict to pick up a fellow staff photographer who was stranded there, and heard on the LAPD scanner an announcement for all units to immediately evacuate that very area. “When I drove through the intersection, there were people already throwing rocks and bricks onto the street, and my own car got hit in the back,” he said. “Luckily I was able to get out of there safely.” After retrieving his colleague, he returned later on assignment and witnessed the looting. When he took out his camera to shoot photos, people with baseball bats chased him and rocks were again thrown at his car. For Korean American journalist K.W. Lee, Sa-I-Gu was not about hindsight. “I knew it was going to happen,” Lee told me. Now in his early 80s, he was a pioneer Asian American journalist, a rare immigrant Asian who began working in 1950s America as a reporter for mainstream newspapers. He said his premonition was why he quit his job to come to Los Angeles to lead a revived, new version of the Korea Times English section in the early 1990s before the Rodney King arrest, beating and verdict. To Lee, who in the 1970s had written about Japanese American WWII experiences and the Chol Soo Lee case as a reporter in Sacramento, Sa-I-Gu was déjà vu. Anyone who has met, heard or encountered Lee knows he doesn’t hold back or equivocate his thoughts, feelings and opinions. Lee believes the black and Korean rift was in large part caused by mainstream media manipulation, to sell papers and increase ratings. For many reasons, Lee was convinced that Korean Americans, especially the offspring of new immigrants, needed an English-language newspaper. It could also, of course, be a means for those outside the Korean-speaking and reading core to gain insight into that community. He went so far as to start the English-language Koreatown newspaper in the 1970s. It was ahead of its time, however, and didn’t last. Lee saw that Korean Americans lacked the infrastructure of the Chinese American and Japanese American communities that were larger and more established than the first wave of Korean immigrants. The numbers began to change, however, with immigration reform in the mid-1960s, reforms that were part of the larger civil rights movement. It was ironic, he said, because it was actually blacks in America who were responsible for this new wave of Korean immigration. By the early 1990s, the Korean American community was ready for his vision; The Korea Times had a small English language section but he was hired to revamp and expand it. If Lee indeed foresaw the trouble to come, he was preparing himself to be a spokesman and advocate for Korean Americans with the weight of a newspaper behind him. Another irony was that the passionate, eloquent and thoughtful Lee was, at the very time when his own voice was needed, at death’s door, hospitalized with a bum liver. He nevertheless said he was dictating editorials to his staff from his hospital bed. A subsequent, successful transplant is why he is still with us now. Might things have been different had he been healthy? No one can say. With one voice silenced, stepping into the breach as a community spokesperson was attorney Angela Oh. Smart, articulate and armed not only with knowledge of the legal system, Oh understood the underlying causes of the black-Korean rift. She would go on to tirelessly appear on TV, in community forums and in news reports, bringing a much-needed perspective. With her unique qualifications, she would go on to be tapped by the Clinton administration to serve on the One America Initiative. Because of that lack of infrastructure Lee mentioned, Oh says Korean Americans were especially vulnerable to the riot-caused collapse of social and political safety nets. “I remember vividly, Korean businesses were targeted,” she said. With the LAPD strangely absent, Korean businesses without an armed presence were victimized. Oh was, according to Lee, “a godsend.” He had known her already for 10 years. While there were, according to Lee, some in the Korean American community who were grateful to her unelected role and service, wondering “Who is this woman?,” there were others, according to Oh, who seemed to resent her. Yet her efforts were pro bono and all the extra work “destroyed my practice.” Oh says she “paid a price” for stepping up when she needed. Still, she realizes what she did was important but she says she is ambivalent about Sa-I-Gu, especially when this time of the year rolls around. She told me that in recent years she had thought about writing a book about her experiences at the time, then decided against it. In retrospect, Oh says she personally missed an opportunity to use the events as a springboard for a political career that could have helped even more people. Many at the time urged her to run for political office, but she laughed it off. Now she wishes she had had a mentor to advise her on how she could have parlayed the events into a means to do even more. According to Oh, Sa-I-Gu meant that the Korean American community was truly born in a social and political sense. Circa 1992, she was among just a handful of Korean American lawyers in Los Angeles. Now there are so many, she noted, that there are two rival Korean American bar associations in L.A.
For Oh, despite the costs, there were positives that came about now that we are 20 years past Sa-I-Gu. She says that as a result of the events of 1992, consciousness was raised, political participation increased, people were engaged, religious communities were mobilized, cross-racial programs were started and people began to understand the power of media. At the same time, Oh says some Korean business owners’ lives were ruined and people were damaged in more than just physical ways. Those of us who could, however, have moved on. So, here we are, 20 years removed from April 29, 1992. We have a president whose ancestry is white and black. We’ve had a Dancing With the Stars winner who is Korean and black. We’ve had two prolonged wars overseas. China has ascended in ways that must surprise even them. We are all more connected by digital technology than ever in our collective human history. Locally, the burned buildings have been rebuilt. The Korean American community that exists now is stronger having been tempered in the fires of a riot. Yet there are signs that what happened before could happen again, especially with a stalled economy for many. Meantime, Lee says that in Los Angeles, he has a great hope — and that hope lies among the younger generations, a real meeting of “East and West.” He notes that among younger people, race is a “secondary issue.” Given America’s history in that department, that is a definite improvement. It’s heartening to see that a wise elder like K.W. Lee can still be optimistic, even with all that has happened. We have an obligation to remain hopeful and to make things better for those younger people. I still agree with that. Giving up is easy. We must choose the more difficult path.